EvC Forum: How many Kinds are there? Author Topic: How many Kinds are there? Since all those creationists tell us about all the real scientific research done by creation “scientists” studying and classifying the “kinds” (the study that they’ve termed “barminology” http://en.wikipedia.org/wiki/Baramin), then what is their result so far as to how many “kinds” there are? I’m sure they it may be unclear in one or two cases, so how about an estimate then? Have they figured out within an order of magnitude even, how many kinds there are? Are they really trying or is it just a word game? Could someone, creationist or otherwise, please just look up the number and let us know? I’ve come across some interesting information about this, which I’ll share after we get a handle on the number according to today’s “creation scientists”. www.evcforum.net/cgi-bin/dm.cgi?action=msg&f=11&t=307&m=76 -->www.evcforum.net/cgi-bin/dm.cgi?action=msg&f=11&t=307&m=76">http://www.evcforum.net/cgi-bin/dm.cgi?action=msg&f=11&t=307&m=76 Hence, I’d think “is it science” as the forum. Or, if preferred, I can post it to RAZD’s thread – seems like it’s a bit off topic though. This seems like a pretty straightforward thread topic, so I’d think there has been a thread about this, but I didn’t see one by searching. If there is, I can just get that one going again. Hey, did the mods miss this new thread proposal? I would like to add that whatever the number of kinds the creationists will come up with, we will assume that it is the minimum number of kinds of animal that lived on the ark for a year. 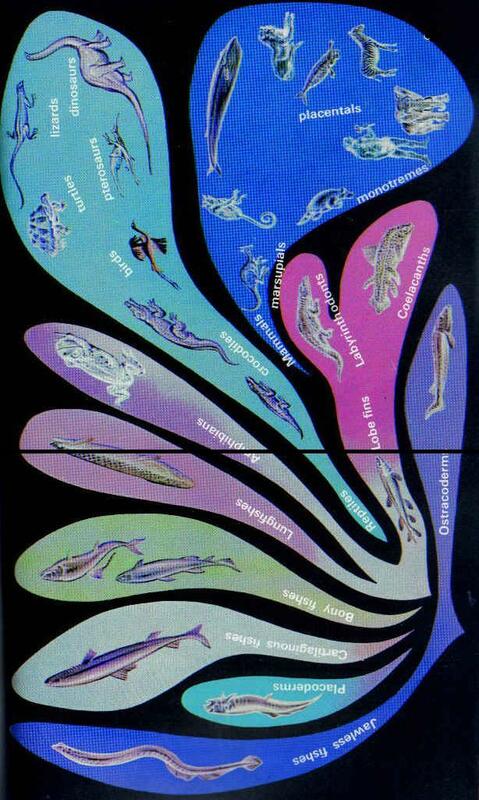 between complex invertebrates and fish . I can not find that Darwin’s consideration (he was under a “conviction” here and Gould did not miss that Darwin said this) at THIS TAXANOMIC LEVEL is any different than Aggasiz’s (in a nineteenth century frame of mind) division of creatures. The baramin or kind appears to divide this division further. I do not see that this is a word game. Since some creationists feel that Gould took over their argument the actual number seems to me to depend on how hierarchy is to be parsed out of clade “branch” points. There are various ways of trying this out. (Gould’s particular examination depends on the difference of allopatry and sympatry but there are other approaches less standard (to the relation of translation in space and form-making). It seems to me that creationist use of hybrids depends somewhat on this distinction as well. It may be that we will see some divergence from this use in the future). My own approach to get back towards the gap Gish mentions involves a complex working out of electromagnetic forces in nervous tissues with direct effects relative to taxogeny. I will present how e-m fields relate to WHOLE FISH structures (lateral line), parts of amphibians (head vs leg), specific nervous tissue in reptiles located in bilateral symmetric situations, and division of sensory organs (of "labour")in mammals for dividing up electro AND magnetic effects via temperature relations (warm blooded advance over birds). The same biophysics I would then work on , in invertebrates. This is what informs me specifically of what a baramin could be if it is really anything more than a lack of conviction about what Darwin said. I have participated in a somewhat long thread on baramins here on EvC but it seems to be buried too far for me to find it with the search function. Because I was somewhat unimpressed with the evolutionist discussion of vicarism and I was supplied instead with a more complex structure in the different prefixes used to discuss baramins I found it useful to think topographically interms of vacariance and baramins. It remains to be seen if this is simply a stage in a more perfect thought or one that will remain with any discovery of life off Earth(see visual here). Well, according to the Woodmorappe's book Noah’s Ark: A Feasibility Study, there are 8000 kinds of animals that breathe air through their nostrils. Creationists at AiG seem to think this an overestimate: (How did the animals fit on Noah’s Ark?. According to Lenny Flank's article here, creationist Wayne Frair at the Arkansas trial gave the estimate of 10,000 kinds in total plus or minus a few thousand. So, from those sources, I'd estimate that there are about a hundred thousand kinds in total. After all, land-dwelling tetrapods represent only a small fraction of life on earth. They are probably outnumbered by insect kinds alone, not to mention all the other invertebrates. Then you have to consider protists, plants, fungi, archaea and bacteria. Plus, most of life that was created are now extinct. I haven't seen a creationist study of this though. Dead Sea Scrolls Say how many Kinds!! according to the Woodmorappe's book Noah’s Ark: A Feasibility Study, there are 8000 kinds of animals that breathe air through their nostrils. Creationists at AiG seem to think this an overestimate: (How did the animals fit on Noah’s Ark?. Thanks Doddy, that’s what I was asking for. They are in a “kind” of bind, since on one hand, they need to make the number large, since a small number means that a lot of evolution had to happen to give the many millions of species today, while on the other hand, they have to fit all these “kinds” (and their food, care, waste disposal, logistics, etc.) onto a supposed ark (plus food after the flood, and their dispersal). To their credit, some are at least trying to give a real answer, with numbers that can be evaluated, changed if needed, and such, as opposed to the other creationists who give fluffy, pointless “answers” that go on for paragraph after paragraph without really saying anything. In all there were 22 kinds. He finished all his works on the 6th day, everything that was in the heavens, on the earth, in the seas, in the depths, in the light, and in the darkness, in every place. Wow, 22 kinds! Now we know. Might this not be the word of God? After all, this was written before any of the books of the New Testament, perhaps around the same time as books such as Maccabbees. I don’t see any reason to know that this isn’t on par with other additions to the some bibles that have been made using texts found in the DSS. Interestingly, the MSS 4Q216 breaks down the kinds by day, saying which were created on which day (thus listing the kinds!). Note that this is the created kinds, thus the number of kinds may have gone up between the creation and the flood, which means that new kinds evolved from the starting kinds, or that some other deity was making kinds on the side. Also – even this text is ambiguous over what a “kind” is, since it descrbes “major kinds”, implying that there are subdivisions of kinds below that (?). As far as the numbers you gave, it’s interesting to see how high those numbers are, now that creationists have available the results of solid evolutionary science to show that they must use higher numbers than just a few dozen “kinds”. Re: Dead Sea Scrolls Say how many Kinds!! Why could not baramin physciotheology be placing the discussion between a division greater than 30 for phyla and the nine that contain most of the species?? It seems to me there is nothing particular secular that prevents the realm of meso evolution of Dobhshansky from denoting since Friar etc as smaller ACTUAL number. There could be some work on the word "number" itself. If I am correct that Darwin's use of the math word could be reformulated in terms of transifinte numbers then I do not see why creationists need be restricted to a number that is a result of gene fixation but rather might be made UP of them. This is why it may not be a word game. There may be structural content hear left behind via the probablistic rather than simple effect of additivty (correlation coeffients add across pedigrees as well as probabilities and thus the same math operation yields different interpretations (probability of common descent and use of maximum likelyhood methods instead). Darwin's maximization may be a smaller number, 22?, than that by post neo darwinian pronouncements alone????? It seems you already knew what you were asking for. OK, here is the breakdown given in the Dead Sea Scrolls – if you read Gen 1:1-31, you’ll see that it matches the Genesis account very closely. 1 7? Several kinds of Heavenly spirits that make rain, snow, etc. ? There are several places where the text is unclear or simply missing. I’ve indicated this with question marks. No, I didn’t know beforehand how many “kinds” creationists had supposed. The reason I asked is because an examination of the kinds can provide evidence as to whether this is of divine origin or of human origin. If it is of human origin, one would expect that the groups to fit a bronze age worldview, with only very general similarities being used, without knowledge of the detailed scientific findings since the Enlightenment. Categories could be expected to overlap because of this lack of knowledge. By this, one would expect the kinds to be very biased toward what a bronze age warrior can see. On the other hand, if this is divinely inspired, one could expect that the classification will be far in advance of what a bronze age warrior would otherwise guess. For instance, it might be pointed out that There is more than one kind of worm (entire phyla), while all vertebrates are a single kind (phylum level). I hope everyone knows better than to use the “people back then could only understand dumbed down science” approach. People back then had the same brains we do, and were just as smart. They were ignorant, but that’s easy to fix with knowledge. Hindus for instance had already postulated a universe billions of years old, and the intricacies of language show that ancient Jewish people weren’t stupid. Because of this, simply telling them the correct answer would have worked well. The upshot is that the list found in the DSS, just like the Genesis account itself which it closely matches, shows all the hallmarks of a bronze age human account, and is filled with scientific errors. For instance, nearly all phyla are hardly mentioned – such as sponges, nematodes, all prokaryotes and archaea, etc. All animal phyla but one (chordates) are lumped into “things that swarm in the water” and “land creepers”. Plants are very crudely classified apparently by reproductive method (except “forests”), with many plants falling into most of the categories simultaneously (many make forests, make fruit, have seeds, and sprouts). Where would all the mosses, ferns and the whole fungi kingdom go? Vertebrates, on the other hand, which bronze age warriors would be most familiar with, are spread over a half-dozen kinds (5.5 of the 7 animal kinds are vertebrates). Lastly, mythical creatures are included, such as sea monsters (or do they mean whales?) and weather spirits – as well as including non-living things, and not knowing that the sun is an ordinary star (just closer). All this shows that this creation account (Gen+DSS) has a human origin, and that attributing it to God is simple blasphemy. Re: divine or human origin? It seems that there are non-living things that are kinds then? I was presuming that only life is included in the baramin kind. I thought that is what I was responding to. can provide evidence as to whether this is of divine origin or of human origin. bucket experiment of divine or human origin? I have always taken it that a shape of a creature, no matter how small (use phenotype notion then when looking in a microscope) may be ID’d with the curve described by Newton here and rather quickly and inadequately simply manage to magine “the torqued rope” to be DNA. Modern biology does not open the conversation if form conceived this way is divine or human as far as I know. I wrote my College Scholar Thesis to document this. When Leon Croizat asked in the 60s, “how does a cell cut” and no one answered him, I understood this to mean that no one was willing to ask if Newton’s relations between absolute and relative space had been answered by population geneticists. Boltzmann was close to the answer. He only said however atoms were not in contradiction to infinite divisibility not how atoms might be related to such divisions whether by God or possibly with nanotech, man-made. I think your squezzing of technology into the question of the kinds is out of time. may assist theology while also changing science. The relation between Cantor’s absolute and Newtons’ may be divine it seems to me. This would not mean that the Dead Sea Scrolls must show signs of advanced general revelation. So before I can be sure whether you and I ARE talking about worms vs vertebrates it matters if the actual infinity the curve rescribes is also supposed to apply to forms of death as well as life. I am not saying that baramin creationists have the only back door newsstand on all ideas about kinds, so you tell me, can spirits be kinds? If so then the logic is more expanded than the one I was considering. Kant’s use of “soul” becomes operative in that case. That is not something that I relate to Newton’s bucket. His experiment was something I could easily relate to at the age of 8, as I would swing a basket full of eggs round my head without breaking them even though my mother’s nack was broken seeing her son whirl breakfast before it was even on the table. Thanks for info from DSS. It would have been just as nice if you had included it in the original post. Those (the bucket experiment, Kant, etc.) are all interesting, but irrelevant ideas. Anyone who truly thinks God is all knowing and all powerful wouldn’t hem and haw about what a perfect God could say. I teach, and it’s easy to see which papers are by people who have learned and those that are ignorant. It’s even easier that that in this case, since the two options are so massively different – a perfect understanding of cosmic history vs a bronze age understanding. I’m sure you can tell the difference between them as well, right? Which would you say Genesis and the DSS are? The inclusion of nonliving things and mythical things I found interesting too, as I noted – and it too fits the bronze age, primitive mentality. I'll go slower this time around. Are you trying to get an idea on the number of kinds that are causally connected to living things or dead patterns?? The information I presented can hardly be irrelevant if one is beyond Locke philosophically and knows how to deal with Berkely experientially. But it would make some difference if the theological subject was not an obvious object of baraminology. You opend with a link to Wiki, hardley the source if you wanted to eventually compare "papers" by one group vs those of another. If you already were decided then there is no need for you to return to the internet. People like me are here because we are able to communicate and develop things that these papers on either ledger side do/did not. If you are going to only base your response to my posts based on this paragraph then there really was no point to post in the first place. It seems to me you are only saying now that baraminology is not really real research. You might as well say that about most any topic in creation science. I am perfectly well aware that God can change the physical laws of any scientist after the fact if not before. I tried to indicate what historical events, left in the work of rather prominenant authors, are responsible for the failure to realize results otherwise written about in either paper kind. To say that a biologist can not have an intuition at possible variance with a physicist is simply a case of lack of concepts. Whether there are real reasons depends on what categories are affected. Your language seems to indicate that there is a legal or expermiental basis to the determination of the results ("it may be unclear in one or two cases"). If your standard (reading into your posts to me so far) which seems to be that if God passed the info on, then one should be able to figure out where baraminologists went wrong, by looking into the differences in the case they wrote anything of an enumerable magnitude is, is correct, then it would matter (not form) how a number is to be coordinated to the kinds denoted in Genesis and/or the DSS. I started to explain what this would entail. You claim it is irrelvant to God. How do you know?? To cite that you teach and that I ought to know the difference belies the reality that just last nite before posting to you I attended a lecture on the Cornell campus by Gary Sick of Columbia, who was hosted by a Presbyterian Historian I know very well , and through our Church, a dinner was put on. He had just been part of the 45 invited to a private meeting with Iran's president. 6 degrees of connection is very small indeed, it knows no respect of teachers or students, however God has it. You might be able to ask yourself if your reply to me is not substantially similar to Wounded Kings' to Mike in the threadConstantly designed baramins and the evolving food chain . I could look into relating this thread to that one if that would help. I still have not found the longer thread on Baramins that I participated in. Edited by Brad McFall, : trying to move discussion along. ……..If your standard (reading into your posts to me so far) which seems to be that if God passed the info on, then one should be able to figure out where baraminologists went wrong, by looking into the differences in the case they wrote anything of an enumerable magnitude is, is correct, then it would matter (not form) how a number is to be coordinated to the kinds denoted in Genesis and/or the DSS. I started to explain what this would entail. No Brad, I started out by asking how many “kinds” creationists thought there were. A simple question. It’s restricted to creationists because science has long recognized that the whole “kind” idea of baraminology is just a word game with no bearing on reality, so I’m not asking what Gould or Darwin or any other real scientist thinks. If I had asked how many species (or genera or phyla or whatever) there were, then real information from real scientists would have been relevant. Doddy answered my question about creationist kinds in about 85 words in post #6. You, on the other hand, have spent hundreds of words and some irrelevant image files saying pretty much nothing. You’ve dropped names of important people passing near you, along with Darwin and Gould, as if they had any relevance on the topic. Your tangents have wafted out on every breeze possible, and you haven’t even listed a number of kinds yet. You’ve mentioned Gould and Darwin as if they knew or cared what the creationist’s would say about the number of kinds. You know, when you started posting on this thread I was hopeful that we could have an interesting discussion, because I’ve long thought (and still think) that you are an intelligent person. However, as with past posts, you bring up wordy and convoluted arguments that leave me wondering if you read the OP, and if you understand what biology is about. I have to admit (and this is addressed to all readers), that I’m still amazed at the sheer amount of damage that creationism can do to a mind. Brad here is an amazing example of that. He’s no idiot – he’s intelligent enough to relate various topics to each other, and is well read, and has a decent memory, yet he can’t seem to understand the most basic science concepts like “what constitutes evidence?”, or “how does science work?” or “how do we know what we know?”. He’s in a completely different league than many of the minds we’ve seen here that have been warped and broken by creationism – you know the people who aren’t the sharpest pencil in the drawer, who sound like a 6 year old even though they may be 16, 18, 23, 39, 56, or however many years old. They post here often, are confused, and often leave quickly. Seeing how completely destroyed their rational brains have become is sad enough, but in many ways it’s even more sad in cases like Brad, where I wonder at who he could have been, and what he could have accomplished for the good of all our world if his strong mind had not been crippled by fallacious reasoning and muddled logic. Well, if this thread is really only about how many creationist kinds there are (and not how they stack up against taxonomic divisions) then any comments about persons posting or reasons to question the number named outside that worldview seems to me to be absolutely not within the parameters of your own guidelines let alone whatever ones restricted to EvC apply (as well). I must admit that if that was all you really cared for having advanced in this thread then perhaps I needed to not have started posting in this one, as I consider THAT to be a simple internet research question, one to which Doddy responded quite well. I figured YOU could have done that as well. Anyway I do not use EVC as means to obtain straight up info, but I find some of the info in the links thread helpful and on point for that purpose. Now you see I assumed that there ARE these kinds. In that case there is no reason why I should not be able to put on my "creationist" bias bait and talk from that point of view. If you think that that is impossible in one mind, then that is not me. When I was first trying to understand *something* that creationist's meant to denote under the logology of baramin studies, I wrote ICR claiming that by putting stamps of creatures on a page my Grandmother in arranging the stamps selected but not placed by my Grandfather actually constituted a "kind" or baramin REGARDLESS OF HOW ICR detained it's use. These books were written however for stamp collectors from an evolutionist's purloined variation. Some of the book covers are available on one of my websites here. I could post pictures of the stamps but you seem to have ordered these out of evidence in this retention. THIS WAS the content of my first communication to Cummings of ICR who graduated Harvard in Biology. I do feel that baramins are maximally ranked and filed Linnean categorizations regardless of the amount of influence evolution thought has influenced the natural history I sustain. I feel I can keep from being tainted within this judgment. If you only want to discuss the number of kinds without this comparison of my own doing then others would be better to engage you. There is clearly some interesting discussion that one can have on how "hybrids" are not difficult for the theory of baramin numerology, but again that is a matter of relatively easy internet research and something that ICR began to exfoliate AFTER I wrote and Wise left Gould's dominion. I have personally "traced" at first what I thought was a word game in the creationist use of "vertical" and "horizontal" evolution but after understanding what they were up against by evolutionists writing IN RESPONSE to them, I came to realize that even that was not a use of words for their own simple advantage. As for the reason that it is hard to get some responsibility of a kind of baraminology to rigor, I find, that the Batesons' problem of "energy" lack between the mid points of meristic variation (even vertebrae) to confound the creationist use of morphology itself and lacking a resolution I am not sanguine for a soon solution. If I find time to do the kind of poking and peeking on the web you seem to want for the content of this thread I will do, else, thanks for a the sustained communication breaching the weekend. P.S. - just so others can know; I think that citing Gould and Darwin AS NOT irrelevant. Darwin speaks of infinite complexity of co-relations between forms which I think is the cause of my grandmother's use of my grandfathers' stamps, but because Bertrand Russell was not privy to Mendelian changes to thought on translation in space and form making and no one attempted to go backward from Woodger THROUGH Russell biology is not ready to cash out this EXCEPT as creationists perhaps a bit preferentially (and overdone) refer to "complexity" molecularly. A genetic criterion for "kind"
The major criterion in determing whether or not two animals are of the same kind can be found in their genomes. Two animals belong to the same kind if their genetic differences can be attributed to simple genetic recombination. If their genetic differences extend beyond what recombination alone is capable of doing, then we know that they are not of the same kind.